We have a partnership-based business model as we generate and combine Nanofitins® for our partners on a target by target basis. 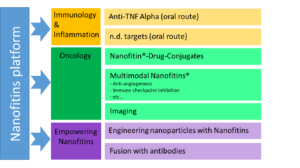 The research programmes listed below represent Nanofitins® currently developed by Affilogic through internal research, on targets non-engaged with partners on an exclusivity basis. While Affilogic focuses on immunology and oncology, it follows the science to any therapeutic area as long as an innovative Nanofitin-based biotherapeutic can make a difference to meet patients’ needs. Usual systemic routes can be travelled by Nanofitins® aiming at neutralising relevant interactions. Their naturally short half-life can be tuned thanks to proprietary albumin-binding technology. What is more: intrinsic properties of Nanofitins® make them amenable to other routes, such as topical administration, up to oral route. Affilogic already demonstrated high performances in this approach of non-systemic targeted therapy, notably by developing oral anti-TNFα Nanofitins® through the SADEL project.